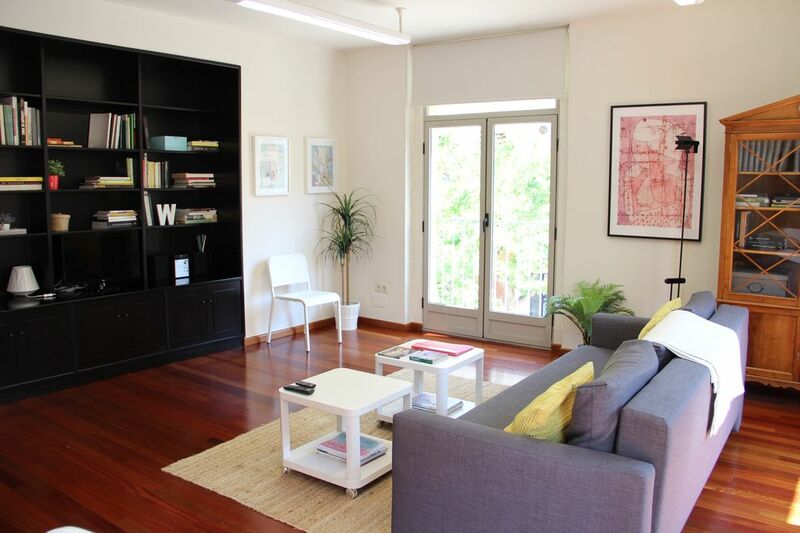 Charming apartment in the center of Valencia with views of the Cathedral. Charming apartment in beautiful square with views of the Cathedral. Charming apartment in beautiful square next to the cathedral with wonderful views. It consists of large room with double bed, living room (with sofa bed) and fully equipped separate kitchen. Luxury quality and newly renovated with brand new furniture. Very sunny. Tv, wifi. It is in the historic center of Valencia, next to the cathedral in a lovely square with landmark buildings and two restaurants with terraces. quiet and perfect for walking, visiting, eating out and dining, and perfectly served by public transport with other parts of the city district. direct bus service to the beach. Had a wonderful stay for Las Fallas. the apartment is steps from the main cathedral in a great part of town. Ana was very helpful with any questions we had. Ana is super responsive to any question or need, very kind and lovely. Apartment had everything one needs for a quiet, very clean and modern flat in the heart of the historic center of Valencia. Highly recommend! Thank you very much Judy, you have been an excellent guests too. This apartment is amazing. We loved it. It is on the first floor overlooking a quiet plaza, but within walking distance of most of the things you want to see. The apartment has five ceiling to floor windows. When they are open you feel like you are part of the plaza, but when they are closed and the blinds are drawn it is quiet. The apartment is very comfortable and functional. I can't say enough about how much we enjoyed this apartment. We did not want to leave. Thank you so much for your comment, Thomasine. It has been a pleasure for me to have you as guests. You have been very kind and I hope to see you again. This suite really was fantastic! We were met in the plaza outside by Ana's friend Sonia, who gave us a friendly and thorough tour of the unit. The moment she opened the door into the unit, we were blown away! The place is huge - we could literally live there. It has beautiful hardwood floors, very nice furniture and modern appliances, and is spotlessly clean. There are very nice decorative touches like the bookcases stocked with books, and accent lighting. We appreciated having the pods and sugar supplied for the Nespresso coffee machine, and the washing machine worked very well. This is a corner unit, so there is excellent natural lighting and there are also very good blinds to keep the place dark and cool during the day. The view across the plaza is awesome. We felt like royalty as we stood on the little balcony watching the people walk by below. The building is very secure and quiet but we were within a 2 or 3 minute walk to a bustling restaurant zone, with lots of good patisserias and tapas bars. Ana was prompt, very friendly and helpful with any queries we had. We loved Valencia and this unit was a big part of it. We would definitely stay here again and will recommend it to anyone we know who visits the city. Thank you so much for your comment, James. It has been a pleasure for me to have you as guests. You have been very kind and I hope to see you again. Thanks for everything. Don't pass up a chance to stay in this beautifully appointed luxury apartment. Although the pictures are impressive, it is even more so in person. This home is sparkling clean and included all the comforts we could ask for. It is centrally located on a quiet square, adjacent to the magnificent cathedral and just around the corner from the hustle and bustle of the main plaza. So many things to do and see! We wish we could've stayed longer and hope to return someday. Valencia is a magical city and this apartment is a gem. Thanks Ana! Thank you very much Charles! you have been great guests, i would be happy to welcome you again. I hope you come back soon! This was a very nice, clean and sober apartment that i can recommend to anyone visiting Valencia. It has wifi (but no pc/printer for your printed check-in), washing machine, tiny tv (with only local stations), stereo with bluetooth, airco and a small but convenient kitchen albeit the extractor hood was not hooked up... but with the plethora of cozy restaurants around every corner, who needs to cook anyway? There is also a decent (cup style) espresso machine with cups provided by the owner for quick cup of coffee. It also has very big door-style windows with tiny balcony from wich you can enjoy the awesome view onto the square and beautiful medieval architecture on the other side. Better still is the location right at a very nice square. Next to this square is the plaza de la Virgin with its nice fountain and tiny cute park. Basically everything you could wish for is right there at a stones-throw away, even a small supermarket and bike rental and all the beautiful ancient buildings, churches, museums and not to mention all the restaurants and markets. Make sure to get a bike and take a tour through the drained river that's practically around the corner to enjoy the serenity of the parks in it and awesome opera building. Even the beach is reachable going this way at 15 - 20 minutes biking tops. Only thing the owner could improve on is the perhaps removing the harsh classroom style tube lights hanging from the ceiling. An other thing was that the owner (who is a lovely lady by the way and very helpful) when showing the apartment kept stressing that we had to be really quiet so we hardly dared to put on the radio. Not sure what is up with that. Also note that although there is a double bed and a sleeping sofa the owner does not allow for more than 2 people to stay at the apartment and you need to be 30 years or older. Besides this little side note we had an utterly awesome time staying here and you'd be lucky to get to rent it. Many thanks Giles for your comments, it's always important for us to get your feedback on your experience in Valencia. I'm happy to know that you have been comfortably in the apartment. Many thanks too for your comments on the extractor hood, everything is already fixed and working properly. If you come back to Valencia, we would be very happy to host you again. Next door is a supermarket.